4. A technician has been asked to configure a broadband connection for a teleworker. The technician has been instructed that all uploads and downloads for the connection must use existing phone lines. Which broadband technology should be used? 5. 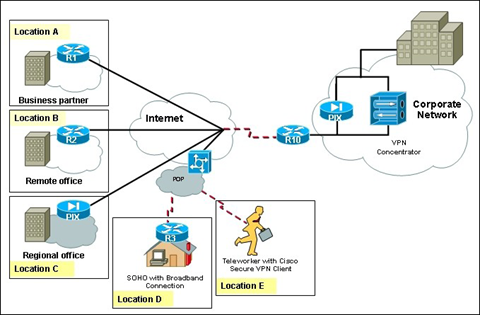 After conducting research to learn about common remote connection options for teleworkers, a network administrator hasdecided to implement remote access over broadband to establish VPN connections over the public Internet. What is the resultof this solution? • A reliable connection is established at greater speeds than what is offered from dialup over POTS. Security is increased, but username and password information are sent in plain text. • The connection has increased security and reliable connectivity. Users need a remote VPN router or VPN clientsoftware. • Security and reliability are increased at a substantial loss in throughput, which is considered acceptable when supporting asingle user environment. • Reliability and security are increased without the need for additional equipment, when compared to dialup connections usingPOTS. 10. Which is an example of symmetric-key encryption? • Delivering services over a cable network requires downstream frequencies in the 50 to 860 MHz range, and upstreamfrequencies in the 5 to 42 MHz range. • Each cable subscriber has dedicated upstream and downstream bandwidth. • Cable subscribers may expect up to 27 Mbps of bandwidth on the upload path. 12. A company is using WiMAX to provide access for teleworkers. What home equipment must the company provide at theteleworker's site? 14. While monitoring traffic on a cable network, a technician notes that data is being transmitted at 38 MHz. Which statementdescribes the situation observed by the technician? • Data is being transmitted from the subscriber to the headend. • Data is flowing downstream. • Cable television transmissions are interfering with voice and data transmissions. • The system is experiencing congestion in the lower frequency ranges. Refer to the exhibit. All users have a legitimate purpose and the necessary persissions to access the Corporate network. • Based on the topology shown, which locations are able to establish VPN connectivity with the Corporate network? • Locations C, D, and E can support VPN connectivity. Locations A and B require an additional PIX Firewall appliance installedon the edge of the network. • Locations C and E can support VPN connectivity. Locations A, B, and D require an additional PIX Firewall appliance installed on the edge of the network. • Locations A, B, D, and E can support VPN connectivity. Location C requires an additional router on the edge of the network. • All locations can support VPN connectivity. Refer to the exhibit. A teleworker is connected over the Internet to the HQ Office. What type of secure connection can be established between the teleworker and the HQ Office? • The devices must use a dedicated Layer 2 connection. • The devices must have the VPN client software installed. • The two parties must inspect the traffic against the same ACLs. • The two parties must establish a secret key used by encryption and hash algorithms. • The two parties must agree on the encryption algorithm to be used over the VPN tunnel. • The devices must be authenticated before the communication path is considered secure.